Pain relief isn’t typically needed for a light chemical peel. If you’re having a medium chemical peel, you might have the option of taking a sedative and a painkiller. If you’re having a deep chemical peel, your doctor will likely numb your skin with a local anesthetic and give you a sedative or use regional anesthesia — which numbs a certain part of your body. You might feel mild stinging while the chemical solution is on your skin. Your doctor will apply a neutralizing solution or wash to remove the chemical solution from the treated skin. You’ll be given intravenous (IV) fluids, and your heart rate will be closely monitored. To limit your exposure to phenol, your doctor will do the procedure in portions at about 15-minute intervals. A full-facial procedure might take about 90 minutes. After a chemical peel of any depth, follow your doctor’s directions for cleansing, moisturizing and applying protective ointments to your skin. After a light chemical peel, treated skin will be red, dry and mildly irritated — although these effects might be less noticeable with each repeat treatment. Your doctor might apply a protective ointment, such as petroleum jelly, to soothe the area. Treated areas develop new skin about four to seven days after a light chemical peel. New skin might temporarily be lighter or darker than normal. After a medium chemical peel, treated skin will be red, tight and swollen. You’ll feel stinging. Your doctor might apply a protective ointment, such as petroleum jelly, to soothe the area. Use ice packs or the breeze from a fan for comfort. Over-the-counter pain-relieving medication, such as ibuprofen (Advil, Motrin IB, others) and naproxen sodium (Aleve, others), may help reduce any discomfort. You’ll likely schedule a checkup soon after your treatment so that your doctor can monitor your healing. After a deep chemical peel, you’ll experience severe redness and swelling. You’ll also feel burning and throbbing, and your eyelids might swell shut. Our doctor will apply a watertight dressing to treated skin. He or she might also prescribe painkillers. Sleeping in a semireclined position may help reduce swelling. You might prefer to remain at home while you’re healing from a chemical peel. Once new skin completely covers the treated area in about two weeks, you can use cosmetics to conceal any redness. 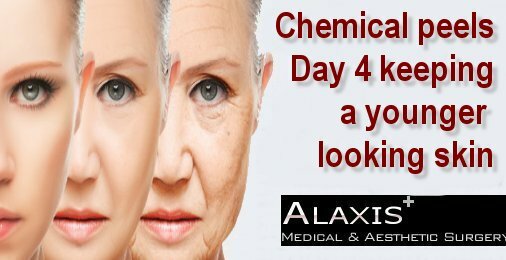 How do Chemical peels help in restoring your youthful look! Does skin resurfacing restore your youthful look?